St. Cloud State University, based in a town of less than 70,000 an hour west of Minneapolis, is as pure of a hockey school as it comes. The school has 19 NCAA Division II teams, and two Division I teams: men’s hockey and women’s hockey. While the team has had a long track of success with a total of 13 appearances in the NCAA tournament since 1998, the numbers of players that have reached the NHL are few in comparison to neighboring schools. But one name stands out among the rest – Matt Cullen. After signing a one-year contract with the Pittsburgh Penguins on July 1, the 41-year-old reminded fans he has solidified himself as one of the best St. Cloud State Huskies and deserves to be inducted into their Hall of Fame. Matt Cullen spent only two years at St. Cloud from 1995-97 since he left for the Mighty Ducks of Anaheim after getting drafted by them 35th overall in 1996. Regardless of only spending two years there, he left his mark on the team. It was his team-leading numbers his freshman season, 1995-96, that must have turned the head of Anaheim’s then-GM Jack Ferreira. The 18-year-old Cullen’s 41 points (12,29) in 36 games was not near the top of the league–he was no. 74 in scoring to be exact. But out of the 73 men who scored more than he had, only two were true freshman like himself (Marty Reasoner, Andy Lundbohm). So, while his numbers weren’t great in the big picture, they were phenomenal for him. In his sophomore season, 1996-97, Cullen led the team in points again with 45 (15-30). He jumped from 74th in scoring to seventh overall in scoring with three SCSU teammates accompanying him in the eight, nine, and ten spots. The Huskies went 23-13-4 that season after having a losing record in 1995-96. While turning heads on the ice, Cullen also kept an eye on his studies and was said to have a high GPA that was comparable to his 3.9 high school GPA. 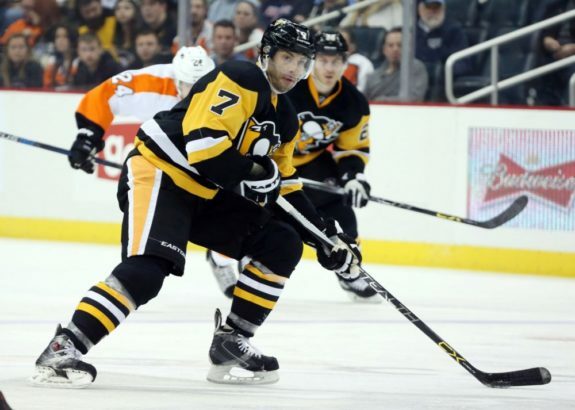 “Dad won’t stop,” said a tweet from the NHL when Matt Cullen signed with Pittsburgh to extend his playing career to a total of 21 consecutive years (minus the lockout). Indeed, the man who is old enough to have a son as old as some of the newest faces to the NHL (and has sons of his own), just won’t stop, and that’s a major part of his legacy. He’s 136 days older than Zdeno Chara (who is still going strong himself), making him the oldest active player in the NHL. While Cullen has traveled to eight different teams (so far) in his time, it all began in Anaheim. Like many players, Cullen saw time in an AHL sweater, but not much. Cullen only spent 21 games in the AHL over his first two years with the Mighty-Ducks. Since then, he hasn’t seen the AHL. And it was well-deserved considering in his rookie season in Anaheim, he notched six goals and 21 assists for 27 points while playing on the second line behind household names of Teemu Selanne and Paul Kariya. Only four years later, Cullen was 23, he hit his career high in Anaheim of 48 points (18,30). That total is only one point short of his career high. Cullen was dealt to Florida in the 2002-03 season and stayed there until the offseason before lockout. Just before the season was called-off in 2004-05, he signed with the Carolina Hurricanes. In the lockout, he led the Italian Serie A league in scoring before returning to the NHL following the lockout and joining the Hurricanes. In 2005-06, Cullen served a depth role while scoring a career-high 49 points (13,36) and playoff-high 21 points (8 goals and 13 assists). These totals were good enough for, on the team, seventh in the regular season and fifth in the playoffs. 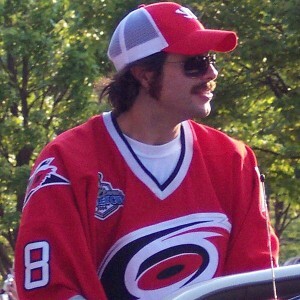 His point total during that campaign, and his three more years in Carolina (he would leave for NYR for the 2006-07 season but the Rangers optioned to return him to Carolina), don’t get him in any team record books–but his contributions got his name engraved in silver in the summer of 2006 when the Hurricanes won the Stanley Cup. More importantly than his point-getting, however, was his role on special teams units and being strong on faceoffs, especially in the playoffs (something we’d see Pittsburgh thrive off in their cup runs, and miss deeply when he left). It was what he did away from the puck and off the stat sheet that often made him such a great player. It was reasons like this why Cullen was named to Carolina’s 20th Anniversary Team. His character, however, spoke and continues to speak louder than any on-ice accomplishment. “His [Cullen’s] true hallmark may be that he is as caring of a teammate the game has ever seen and is everything a hockey player is supposed to be,” said the Hurricanes in a video about him being named to the 20th Anniversary Team. Cullen was traded from Carolina to Ottawa during the 2009-10 season. 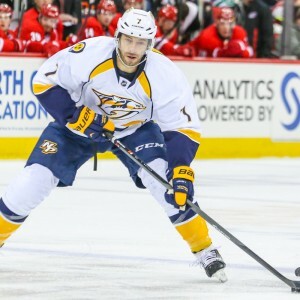 Through the following eight years of his career from 2010 to 2017, Cullen spent his time between Minnesota, Nashville and Pittsburgh. He was 34 when the 2010 season rolled around, and his point totals dropped from the 30-40 range to the 20-30 range, which is expected and by no means bad. 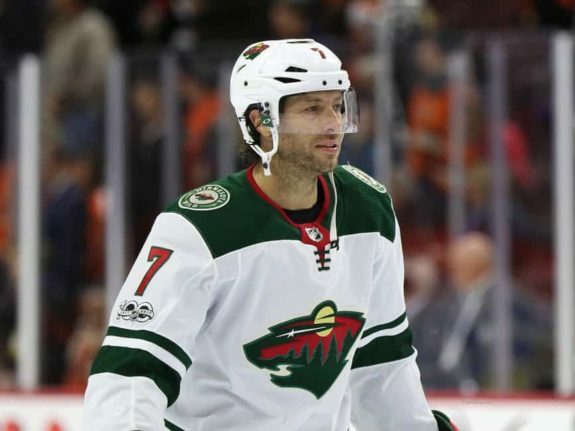 Cullen left the Senators and suited up for his hometown team, the Minnesota Wild. Cullen hit the high 30s in points in both 2010-11 (39 points) and 2011-12 (35 points), but both years the team failed to qualify for the playoffs. In the shortened 2012-13 season, the Wild made the playoffs, but fell in five games to the to-be Stanley Cup Champion Chicago Blackhawks. Following that season, Cullen spent two years in Nashville where accumulated 66 total points (17,47). Again, he saw spotty playoff time with the Predators only making it one out of the two years where he was eliminated, again, by the Chicago Blackhawks in the first round. Come 2015-16, Matt Cullen ran into a little luck. And by little, I mean a lot. 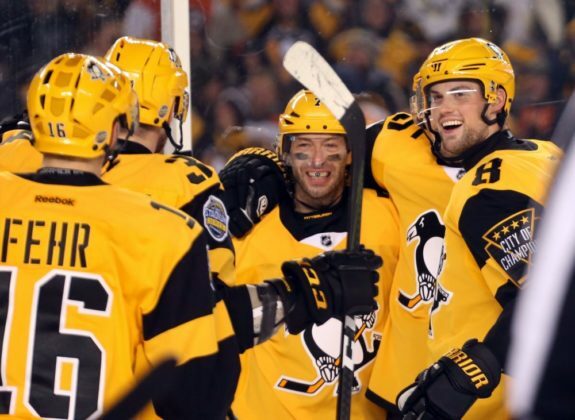 Cullen signed with the Pittsburgh Penguins, was awarded with an ‘A’ on his sweater, and went on a tear of two deep playoff runs where the Penguins would go on to defeat the San Jose Sharks and Nashville Predators in back-to-back Stanley Cup victories. In the second cup run in 2016-17, Cullen also scored nine points (2-7) in the post-season–his highest totals since his cup run in Carolina. With two new shiny rings on his fingers, he returned to Minnesota. His lowest career totals came that year when he got 22 points (11-11) with the Wild. He was ranked 299 out of ~600 in league scoring, which, again, isn’t dreadful considering the depth role he was filling. And as said previously by Carolina, he holds a lot more value than just scoring goals and passing the puck. Minnesota understood that and appreciated having the Minn. native on their team so much so that he was nominated from their squad for the Bill Masterton. “I think I’m more proud of that [helping the community] than anything I’ve done on the ice…I feel really fortunate to give more than I deserve. Along with Bridget [his wife], we both feel like it’s important to make a difference in other people’s lives,” Cullen told the media when it was announced he had been nominated. The Masterton is an award for “perseverance, sportsmanship and dedication to hockey”. He was nominated on the grounds of being active in the community with his and his wife’s Cullen Children’s Foundation, on top of being the 38th player ever to participate in 1,400 games and having over 700 career points to his name. Matt Cullen might have hit a career low in points and already built legacy anyone would be comfortable to have, but his love for winning it all hasn’t slowed down; he didn’t just return to Pittsburgh because he loves it. He wants to win. “I’m really excited to be coming back. It’s a cool opportunity at my age to come back and have another chance at making a run with this team…There is still a lot of competitiveness in me, and a part of me that wants to prove that I can still play and be a difference maker…If you get an opportunity like this at age 41 with three boys that love the game of hockey and love what we had in Pittsburgh, my wife being supportive and competitive, we just looked at it again as an opportunity that was too good to pass up” Cullen told the Penguins’ media after his signing. Cullen was a star in college. He has been fairly consistent offensively in the NHL. He’s one of the more reliable defensive centers in the league. He’s was also considered one of the best Minnesota-born Minnesota Wild while he was on the team. What he’s accomplished in his career will be difficult for anyone else to replicate. Only Bret Hedican rivals Cullen’s career legacy at St. Cloud. Hedican himself is an SCSU Hall of Famer and one of the most interesting St. Louis draft picks. There are several similarities in both their careers, but also aspects that make them unique all their own. Given Cullen’s long, consistent, and effective career, Cullen has to go down as one of the best Huskies of all time, and deserves an induction into their Hall of Fame.